I have nineteen little beaked mouths I’m feeding right now. Of the nineteen, eight are currently laying. I have two hens who are brooding and nine little babes. If you know your profit & loss math, you can see I’m not in a great position right now. Because I ferment my chicken feed, I’m currently breaking even. People often discuss fermenting feed for chickens, but they only talk about adult hens. 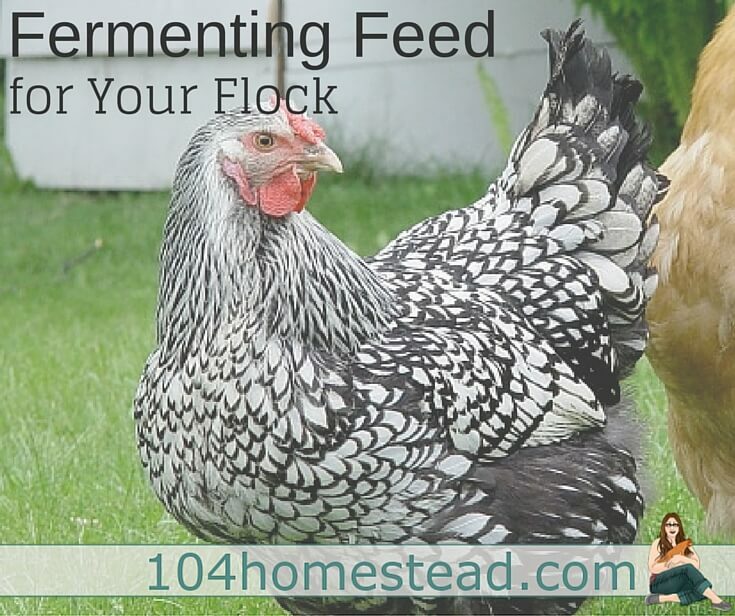 Did you know that you can ferment feed for all ages and all variety of poultry? My chicks and ducklings start getting fermented feed when they are a week old. I only wait that long because they are still in the walk through their food phase in that first week and things get messy quickly. The ducklings get an extra step in their fermented feed process, but it takes literally a moment more. I’ll get into that in just a minute. How Do I Save $ Fermenting? That is an awesome question! First, less waste. Chickens (especially) enjoy scratching through their food and dropping it all over the place. I’m not sure about your birds, but my posh poultry do not eat pellets that have landed on the ground. Bugs are fine. Feed is not. Second, increased nutrition. The fermenting process increases the nutrient levels of chicken feed as well as the birds’ ability to absorb the nutrients. As a result, birds consume about 1/3 less than they would on dry feed. There are two ways to ferment your feed. Here is a very basic description of how it applies to chicken feed: Lacto-Fermenting involves grabbing good bacteria from the air and creating a lactic bath. As long as the water stays above the feed, the feed will stay preserved. No starter is required with this method since the feed and the air have the required bacteria already present. Alcohol-Fermenting is similar to the beer making process, but no, you won’t have a bunch of drunk chickens flitting around your yard. This method requires adding yeasts to the chicken feed. Lids are suppose to be tight as contact with the air can cause contamination. Burping the container (opening the lid to scoop out feed) is suppose to be enough air exchange to prevent the container exploding, but having concocted a few alcoholic beverages in my day, I would use an air exchange plug to play it safe. You can get one for under $5 at a beer supply store. This method works best with lacto-fermented feed, but it will work just fine for the alcohol fermented feed as well. The assembly and feeding process is very similar. I use a two bucket method. I have one bucket with holes drilled all over the bottom half. This is the bucket that the feed goes in. I have a second bucket that the first slides into. This is the bucket that keeps in all the water I’m going to add. Basically the inside bucket is a giant strainer. I’ve got an industrial-strength hook mounted above the feed buckets. When I’m ready to feed, I lift the inside bucket up by the handle, hook it on the hook and all my starter water strains into the other bucket, leaving behind the nice fluffy feed for my scooping pleasure. The base of the chicken feed (at least in my case) is Multi-Flock commercial feed in pellet form. Not only are pellets cheaper, but they don’t break down as easily, so there is still some solidity to the feed. Some people ferment grains only, but I prefer to know that my birds are getting at least their minimum dietary needs. After that, you can add just about anything. I mix in whatever is in season (aka: whatever is cheapest). This last batch had some cracked corn, field peas, wheat and flax. You can add grains, food scraps (no dairy or meats) as well as scratch. I do my best to keep the ratio 2/3 commercial feed and 1/3 add-ons. Once all the solids are in the bucket, just top it off with water. Again, with lacto-fermentation, the water level needs to stay above the feed. It’s all about bubbles and smell. You will see bubbles forming in it when it’s actively fermenting. Although you can feed it as soon as it’s had a chance to soak, it takes 3-5 days to actually begin fermenting. Not only will you see bubbles when it’s ready (and maybe foam sitting on the top), it will have a sweet smell. To me it smells like pizza dough. Sniff your feed often. Although it is hard to mess up lacto-fermented feed, it can happen. If it has a rancid smell or it seems sour you will need to dump and start over. You cannot save the starter liquid. You will have to start at the very beginning. As mentioned before, ducklings require one more step. They require additional niacin in their diet. I get nutritional yeast at my local health food store. It costs hardly anything and it is jam-packed with niacin. Since my ducklings are housed separately during the time they need the additional niacin, I scoop out some dry feed just for them and sprinkle the dietary yeast on top (not a science, just a bit is needed – maybe 1 tsp per cup of feed) and shake the container to get it mixed in. Then I ferment just as I would everyone else’s feed. I wont lie, fermenting is harder than just putting out a container of dry feed. You have to feed each day (opposed to every couple of days with dry feed). Batches can go bad. Just the other day, my buckets vacuum sealed together leaving me elbow deep in fermenting water trying to scoop out the remaining feed until I could get the buckets apart. I don’t do it during the winter since I don’t want to keep the buckets in my house. Fermenting is great for saving money and it does help with the birds’ digestion. It is definitely a great option when you need to shave off a few bucks from your poultry bills. If the chooks aren’t eating the dry pellets I put out, would they be more likely to eat the pellets if they are fermented ? I think that the reason why the birds eat less fermented feed is not due to the digestibility, but due to the high water content. I’m confused about part of this process and leftovers. When you ferment the chicken feed in your two buckets (I do this with bokashi composting), after 3-5 days or once fermented, you strain the now fermented feed and drain the liquid off. But after you have taken enough fermented feed for the day to feed the flock, do you put the fermented feed back in the originally drained liquid, does the bucket of fermented feed just hang as is and dry out, or do you cover it with fresh water? Thinking that if I made a bucket of fermented feed, I would have too much fermented feed to give them all at once and will have leftover. You take out what you need and then put the bucket back into the liquid bucket. You top with water as needed to keep the feed below the surface. As the levels of feed go down, you just add more and give it a stir. I get buckets apart with compressed air. Stick the nozzle in between the buckets and let the air lift the bucket out of the other. Do you ever feed your chickens fodder? I’m just starting my flock with 11 chicks and have just started raising fodder from oats to give them. I’ve read a lot about fermenting their feed also and am wondering if you can do both? Thanks for any advise you can give. I have in the past, but my toddler has made growing anything indoors a challenge. I probably will again this summer when I can do it on the deck. It’s a great idea to do both because it offers a natural, well-balanced diet. Growing sprouts is also a nice healthy addition to your flock’s diet. Thank you Jessica. My husband and I just bought our 5 acre farm that needs tons of work. I’m starting with chickens and quail, but by next year I want to add pheasants, ducks, and peacocks. I am finding lots of information on how to feed your chickens healthy and inexpensive, having a little more trouble with the quail. Do you have any experience with them? My daughter really wants quail. I thought I would ask, thank you for your awesome information. I don’t know to much about fermenting feed for quail, so I did a bit of research. None of my quail-keeping friends ferment their quail’s feed, even those that do so for their chickens. I asked why and they all said they hadn’t considered it. None of the forums online provided much help either. I did find a research paper that stated that the benefits of fermented feed are similar with quail as they are with chickens. An increase in egg production, higher quality eggs, as well as a decrease in coli and other bacteria. I’m not sure how much help that is to you, but it seems to me that it would be worth a try. I live in Nebraska and we have to watch that their water doesn’t freeze and I would assume that fermented feed would freeze too. Where do you live that you don’t have to worry about that? Should I just wait for the summer to come before trying this? I have had the feed freeze a few times (though not as quickly as the water does), but the birds don’t seems to mind. It sort of turns into a flock block, keeping them busy as they peck away at it. Fermented feed does, however, need to be fermented indoors. It can be a bit challenging getting it to ferment with indoor temperature fluctuations. If you’re getting started, I suggest waiting until spring. That way you have some experience under your belt when you start dealing with winter. What do you do if you go out of town? Will the chickens just go back to the dry feed? I want to ferment for health reasons, but I would like the ease of dry food when I have others watching over them. Also, I have 23 chickens…how much feed would I put out each day? You should have no problem transitioning your birds to dry when you go on vacations. They won’t flock to it like they do fermented, but they’ll nibble through the day. As far how much to feed, there are so many numbers floating around and none were helpful when I got started. I would estimate that I serve my girls about 1/3 what I did when I fed dry feed. Even that figure changes seasonally. In the spring there would be some left in the dish, so I’d cut back a bit. In the fall, they’d seem still hungry and finish the dish quickly, so I’d add a bit more. It’s really trial and error at the start until you get a feel for it. I still keep a small dry feeder in the coop in case they are still hungry. It usually goes untouched. I share 11 chickens with a friend at her 2 acre plot. I’m having a dilemma! My friend ONLY wants to feed them grain & mash that have been fermented. Whereas, I want to offer them a variety of dry and fermented. I have watched them turn up their noses at fermented food, and eat the dry like their starving. I’m wondering how to judge if the ferment has gone bad. Is there any way to tell? Whenever I put dry into their trough, my friend comes along and scoops it into the ferment. She doesn’t start new batches, just uses the one as a starter and adds to it. I’m concerned that it’s too cold out to force them to eat spoiled. Is there a definitive way to make ferment? HELP, need advice! I feel for your plight. I don’t know I could share my chickens 🙂 The fact that the chickens aren’t eating the feed leads me to believe it’s gone south. Usually a bad batch has an off smell and the start of mold growth. Properly fermented feed should smell sweet and yeasty like bread dough. I am a fan of the recycled water method, but you do need to keep a very close eye on it. It may be time to start a new batch and hang a dry feed feeder just in case. Do you add dry food as you scoop ff out or just let the bucket run out and then refil? Many people refill as they go, but I wait until I get down near the bottom. When it seems like there might not be enough for the following day, I fill the bucket back up. It was just easier for me that way. I store the fermented feed right in the coop, but for space-saving purposes, the dry feed is stored in the garage. Laziness is the only reason for my method. I’ve been fermenting feed for over a year and I am possibly a little sloppy about sealing the bucket. I seal it mainly to keep my dogs out. I don’t use two buckets because the chooks go through it fast enough. I agree with the money saving part but only slightly. I maybe cut down on purchasing feed by about 1/4-1/3 less. I use a commercial feed and then I mix with wheat berries, lentils and many other things on hand that I know the birds like. Too many black sunflower seeds can hurt the liver of the chickens from what I’ve heard so I feed those sparingly now even though they love them. I often sprout lentils for them in the winter too. Old bread goes into the bucket as well as oatmeal, whole oats. My mash is different depending on what I’ve purchased, what’s on sale etc. Chooks come looking for me when they want their mash, so yeah it’s like a treat. I love two things about your comment. First, as you said, the mash is always different. I think that’s a great thing about fermented feed. It changes up their diet. No one likes eating the same thing every day. I also love that you mentioned sprouting. I’m hoping to do that as a post topic this fall as one of the ways to add greens during the winter. So do you just keep the water above the feed level or do I need to also cover it? I put a lid on lightly because otherwise bugs get in, but if you keep the water level higher than the feed it won’t spoil. You will see I edited the post to add why fermenting saves money. The big reason is that the probiotics that fermentation creates increases nutritional value and it also increases the ability to absorb nutrients (meaning the bird meets its requirements with less intake). A secondary money saver is that the birds are less likely to waste feed. My girls act like I’m giving them this special treat every morning. They don’t fling it all over the place or scratch it out of the dish like they did with dry feed.